Here’s one of the many reasons why the brilliant Philip Seymour Hoffman will be so sorely missed: his mere presence prompted other actors/actresses to up their game. Case in point here in A Most Wanted Man: the couldn’t be lovelier but normally vapid Rachel McAdams, shaky German accent and all, manages to actually make you feel for her troubled lawyer accused of being a social worker for terrorists. What’s even more amazing is that in an adaptation of John Le Carre novel you actually feel anything for anyone! With the emotional powder keg of The Constant Gardner being the exception to the rule, Le Carre’s spy procedurals are normally colder than an interrogation room metal tabletop. Yet Anton Corbijn wisely allows his A-list cast to tap into the quiet, bubbling under the surface, heartbreak of this post 9/11 spy-eat-spy world. 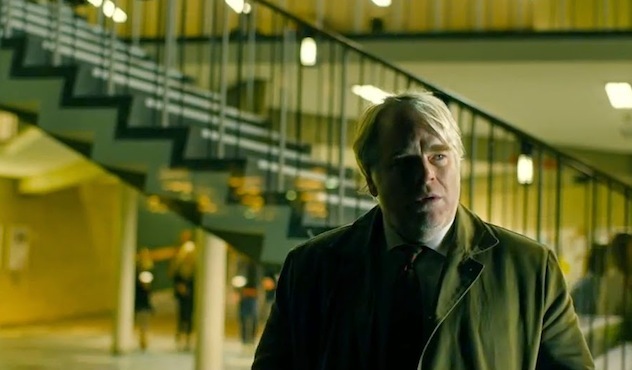 Philip Seymour Hoffman is Gunther Backmann, a world-weary German intelligence station chief in Hamburg who was burned by the CIA at his last post in Beirut where assets were betrayed and lives lost. He’s quietly been toiling away, utilizing McAdam’s liberal lawyer to reel in his minnow, a Chechen Muslim who entered Germany under cloak and dagger, that he hopes to dangle in front his barracuda, a renowned Islamic political activist and spiritual leader thought to be secretly funding a shipping company with terrorist ties. He tries to keep the CIA, represented by a professionally flirtatious Robin Wright, at bay, while aided by his right-hand woman played with subtle skill by the fantastic Nina Hoss. Willem Dafoe, meanwhile, plays a banker used as a pawn to channel the alleged funds that were left behind in secret by the Chechen’s recently deceased Russian crime lord father. Unlike the last film adaptation of a Le Carre novel, Tinker Tailor Soldier Spy, I had no trouble following what was happening here, as screenwriter Andrew Bovell stacks the blocks competently without it turning into a Rubik’s cube that can never be solved. And although his script doesn’t exactly spell it out, the cast performs subtle maneuvers to give what could’ve been a painfully cold exercise some emotional heat. Witness the exchange between Hoffman and Hoss on a steak-out. There’s some banter about “types” followed by a fake kiss to conceal their identities from their passing mark. The way Hoss’ hand lingers just a little too long before releasing from Hoffman’s arm is a masterpiece of non-verbal acting that speaks volumes about the secret longing of people trapped in the monotony of everyday lies and cons. Then there’s the aforementioned McAdams, showing range and depth she has never shown before, in an exchange with her Chechen charge where a family heirloom is placed in her hands hinting at a romance that could never be under the circumstances. Meanwhile Corbijn tightens his grip with his perfectly composed filmmaking. With the aid of cinematographer Benoit Delhomme, he turns the gritty industrial landscape of Hamburg into something oddly beautiful, where once freshly colored paint was haphazardly used to cover up post-Cold War squalor only to be faded over in the past decade by the fog of the War on Terror, where spies are housed in the same age-old bureaucracies creaking with modernity. Witness the perfect composition of a scene where Hoffman and Wright meet at a penthouse bar with floor to ceiling glass walls overlooking the Hamburg harbor seemingly haunted by ships and cranes in the hazy daylight fog. Then there’s the deceptive trip to a warehouse hideout rooftop where McAdams and her Chechen pensively watch the sun set against the urban landscape while his room gets wired. Meanwhile, Herbert Gronemeyer’s score provides the perfect tonal accompaniment. Sure, one could easily say the film moves at a snail’s pace, but it’s meant to be a slow burn. And yes, some of that burn almost gets extinguished with too much focus in some scenes on the minutiae. But the drudgery of the work is meant to be juxtaposed with the heartbreak of the double-cross to make it all the more tragic because of all the hard work that moved the chess pieces into place in hopes of making the world a safer place. That’s the whole point, according to Wright’s character, and a thought echoed by Hoffman’s when asked about his end game. “To make the world a safer place, isn’t that enough?” both characters muse with equal parts naked honest and blatant treachery. For what it is, an exercise in plot craftsmanship through adapting a cold John Le Carre novel into a cinematic spy procedural designed to allow an A-list cast turn up the heat, A Most Wanted Man is nearly perfect. The film’s climatic scene of double-crossing, where pent-up frustration is expelled in Hoffman’s breathless expletive spewing and McAdams is left collapsed on the curb in silent grief, you feel not just sadness for what their characters lost, but sadness for what we lost when he left us all too soon. As such, A Most Wanted Man serves in some small way as both a triumph of, and tribute to, craft. This entry was posted in Art-house Cinema, Book to Film Adaptations, Movie Reviews, Movies, Politics and tagged A Most Wanted Man, Andrew Bovell, Anton Corbijn, Benoit Delhomme, Germany, Hamburg, Herbert Gronemeyer, John Le Carre, Nina Hoss, Philip Seymour Hoffman, Rachel McAdams, Robin Wright, Spy Movies, Spy Novels, War on Terror, Willem Dafoe. Beautifully written! Yes, I agree to most of what you’ve said about the film. Appreciate your very perceptive analysis, esp. the banter about types, “the way Hoss’ hand lingers just a little too long before releasing from Hoffman’s arm is a masterpiece of non-verbal acting…” Rachel McAdam has probably given one of the most difficult roles of her career, which is good for it pushes her performance to some layered dimensions. What I don’t quite agree is, I don’t think it’s a slow-paced piece. I think it’s more like an edge-of-your-seat kind of work, and, this I agree: it’s a film that I can grasp (almost all of the time), unlike Tinker Tailor. As for PSH, a great loss indeed. Arti – I think for fans of Le Carre and subtle filmmaking/acting, this is an edge of your seat kind of work. But for many, this type of film is sadly considered a snore – my brother remarked he almost dozed off and was ultimately disappointed while another old man in the audience remarked as the credits rolled, “Well, that was a waste of money, huh?” Although come to think of it now, not sure if he was referring to his ticket price or those inherited millions of the Chechen.